The Wisconsin Supreme Court recently declined to extend liability to persons who, despite being aware of an underage drinking party on their property, did not actually provide the alcohol that led to a tragic car accident. If such an expansion of liability is to occur, the court said it should come from the legislature. 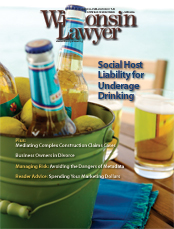 The author explores the history of social host liability for underage drinking in Wisconsin and the current state of the law after the supreme court’s Nichols decision. Unique issues arise when a business owner is a party in a divorce action, including valuing the business and determining income available for support or maintenance. Here is a basic overview of the issues for attorneys representing either the business owner or the nonmanaging spouse. Large and complex construction claims cases often involve 20 or more parties, millions of dollars in claims, complicated factual and legal issues, intricate insurance coverage questions, a host of conflicting motivations and perspectives, and often occur while construction is ongoing. Here are some broad lessons learned from mediating complex multiparty cases. No matter how limited your marketing dollars or experience may be, you're more likely to succeed if you have a plan. Best of all, the plan need not be complicated. Respond to our next question: How can I avoid negotiating the bill after the work is done? A client of many years has asked for a percentage discounted from his bill. We frequently perform work for this client, but he does not use our firm exclusively. How can I avoid a round of negotiations over the bill after the work is done, while at the same time maintain a good relationship with our client? Sara Liu became a U.S. citizen on April 15, the day most American tax-payers dread. More than 800 people joined Marquette President Robert A. Wild and Marquette Law School Dean Joseph D. Kearney on May 22 to break ground on Eckstein Hall, the future home of Marquette University Law School. We’ve made good progress on the three initiatives I laid out for this year: access to justice, unauthorized practice of law, and the Wisconsin Judicial Integrity Committee. I plan to focus my time now on judicial election reform. Know anyone who's taking the LSAT soon? How about the SAT, ACT, or GRE? If so, direct them to LearningExpressLibrary, an interactive online learning platform of practice tests and tutorial course series. David Bilinsky, the practice management advisor and staff lawyer for the Law Society of British Columbia, recently blogged about a "spear-phishing" attack involving the legal community. Phishers sent emails to executives that purported to be U.S. federal court subpoenas. On May 19, 138 Marquette Law School graduates were admitted to practice. The State Bar of Wisconsin Construction & Public Contract Law Section has assembled a List of Arbitrators and Mediators and new Wisconsin Rules for Arbitration of Construction Disputes for construction-related cases. Not paying attention to metadata in electronic files can cause embarrassment and serious damage to your practice and reputation. You must keep confidential information confidential. Here’s why. What Keeps You Awake at Night? What is the Best Way to Spend My Limited Marketing Dollars? I have no marketing expertise, limited money and even less time, but I know I should be doing something to generate new business for my small firm. Should I put my money in building a Web site, taking out ads in yellow pages or community papers, joining local community groups, or doing something else entirely?